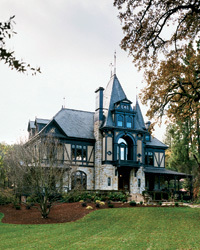 Beaulieu Vineyard's Georges de Latour Private Reserve has helped define Napa Valley Cabernet Sauvignon since 1936. Now, after some tough years, the wine is once again among the valley's greatest. F&W's Ray Isle reports from the barrel room. My first experience in the wine business was as a cellar ratindustry lingo for the lowest-guy-on-the-totem-pole workers who haul barrels, pump juice and generally do the grunt work around wineries. I went into it like almost everyone who ventures into the wine business, with a romantic idea of what making wine entailed. I came out of it having run over my own foot with a forklift, among other mishaps; like many fine romances, mine had run aground on the rocky shoals of reality. I limped for a week. So it was with a much more jaded worldview, and a pair of steel-toed work boots, that I arrived at BV winery last October to work for a week as a cellar rat, intern level, once again. I was going to be embedded (I've always wanted to be an embedded journalist, albeit without the guns-and-land-mines part) in the brand new winery-within-a-winery that BV had put together specifically for the production of its top wine, Georges de Latour Private Reserve Cabernet Sauvignon. BV's ambition was to bring Georges de Latour back to the pinnacle of Napa Valley Cabernet, a place from which it had slipped quite some time ago. My ambition was to see how they planned to do that. Jeffrey Stambor. Photo © Diageo Chateau & Estate Wines. The first task waiting for me at BV, I was told by Jeffrey Stambor, the head winemaker, would be helping out with some barrel fermentations. "Great!" I said, having learned long ago that this is the only appropriate answer when given a task at a new job. Besides, what the heck: I was there to work, plus I'd barrel-fermented plenty of Chardonnay back in those long-ago, man-versus-forklift days of my first winery gig. As it turned out, though, I still had a few things to learn, or at least relearn; among them, that barrel-fermenting red wine is a bit different from barrel-fermenting white wine. With whites, one simply fills up the barrels with juice and bangs a bung into the little hole on top. Easy-peasy, as the English say. Red wines, though, get their color from the grape skins. So first, one must get the grapes into the barrel. Very different story. What that morning found me doing was prying the metal hoops off 20 or so barrels, removing their heads (the circular flat ends), filling the now-headless barrels with grapes as they came pouring off the sorting table, and thenthere's always a hitchclosing the barrels back up. And what that entailed was carefully tapping the head back into place, and then, using a five-pound metal hammer and a chisel-like steel widget called a hoop driver, whanging the metal hoops back into place again as snugly as possible. Whang whang whang whang whang. Whang whang whang whang whang. I did have help with this: my boss for the morning, Jason, a pleasant fellow with arm muscles that made the Hulk look puny. "All good?" he asked me at one point. "Great!" I said cheerily, trying to ignore the fact that after 300 whangs or so, a five-pound hammer feels like it weighs about two tons. But one good thing about a brainless task like hammering hoops is that it gives you a chance to think. Beyond being the flagship Cabernet of one of Napa Valley's best-known wineries, BV's Georges de Latour Private Reserve is one of the few iconic California Cabernets. I'm not including the so-called "cult" Cabernetsthe Harlans and Screaming Eagles of the worldin this category, because pricey and sought-after though they are, and even as good as they are, they just don't have the historic weight. I mean the Cabernets that helped define Napa Valley Cabernet Sauvignon, or helped clarify what its winemakers could aspire to. Robert Mondavi Reserve, Beringer Private Reserve, Heitz Wine Cellars Martha's Vineyard, Chateau Montelena's Estate bottlingthese wines live in that realm. Georges de Latour has even deeper roots. Those wineries came to prominence in the 1960s and '70s; BV's Georges de Latour was already a great wine in the 1940s and '50s (the only truly comparable wines were the renowned Inglenook Cabernets of that era, but those are long gone; these days, Inglenook is just a name slapped onto bottles of $5 White Zin). As Stambor said to me, "It's not so much standing on the shoulders of giantsa lot of the time it feels more like the giants are standing on your shoulders." André Tchelistcheff. Photo © Diageo Chateau & Estate Wines. Principal among those giants was André Tchelistcheff, the winemaker who created the Georges de Latour Private Reserve and made it from 1938 to 1973. "Giant" can be used loosely here; Stambor, who knew him at the end of his life, says, "André was a little over five feet tall, and if he weighed over 100 pounds you'd think he had rocks in his pockets." 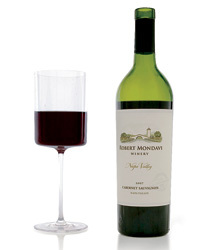 Tchelistcheff's ambition was to create a great Cabernet, and he succeeded. While I was at BV, I got to sit down to a retrospective tasting of Private Reserves going back to 1969 (more fun than hammering barrel hoops, I'll admit). That '69 was still resolutely alive after 40 years, with scents of tea leaf, dried currants and mocha; a tangy, orange-peel acidity; and a silky texture. It seemed unlikely to me that some of the later vintages we tasted would last as well, nor were they necessarily as inviting. A lean and tough 1986 was interesting, for instance, though one of my fellow tasters' comments"so hard you could knock sparks off it"was right on target. But any wine made over decades necessarily has ups and downs. All of the top Bordeaux have had fallow periods, decades (even centuries, in some cases) where the owners weren't really paying attention, or didn't know what they were doing, or, sometimes, just plain didn't give a damn. Nor are California wineries immune. Stambor recalled, "One president we had in the '90s had this bright idea: Harvest is all about logistics. So we'll get someone from the military in here to handle logistics!" He added darkly, "Safe to say there was a winemaker rebellion against that idea." Of the classic Cabernets that have helped define California wine, some, like Georges de Latour Private Reserve, are aiming for a renaissance of quality; some have slipped, apparently permanently, into a kind of vinous senescence; and someJoseph Phelps Insignia, for instancehave been at the top of their game for decades now. Of course, there are external developments that affect the long-term character of a wine. For instance, the first vintage of Private Reserve, the 1936, was aged in French oak. But World War II got in the way in the 1940s, so the winery switched to American oaka decision borne of necessity, but also a major stylistic shift. Only in 1989 was aging in French oak reintroduced. Yet a great wine also has a personality; it keeps its character, despite what clothesor oakit wears. "For me," Stambor says, "a really spot-on descriptor for Georges de Latour is a briar patch in late summer. There's an earthy note from the dirt that's been turned up, an herbal note that's really more like dried leaf, and that juicy blackberry character. There's a powerful tradition to be mindful of here, so when I make this wine, what I'd like is for there to be a certain reflection of that house style that's been created over 100 years." Undoubtedly, that's what my fellow intern Erin and I had in mind when we added the yellow nutrient tablets to the wrong barrels. Erin was a lively Australian woman whose devil-may-care attitude occasionally seemed to get her in trouble. "Did I tell you I smashed up my car yesterday?" she mentioned offhandedly, shortly after we met. When I asked her how she'd gotten into working harvest, she replied, "I was working in the café at Penny's Hill [an Australian winery] and heard you could make a lot of money during harvest. So I thought, Well, I like that! And maybe it'll be interesting. Now I'm on my fourth harvest, first one overseas." What Erin and I were working with was a box of horse pillsize yellow tablets, two of which had to be added to barrels in which the fermentation wasn't moving along at the right pace, to provide additional nutrients for the yeasts (a regular morning winemakers' meeting determined things such as this). The barrels were numerically coded, in sequence, so if you started at barrel 14, say, you could count right down the line to barrel 22. Foolproof, right? Twenty minutes into our task, Erin and I were standing on top of the scissor-lift looking at the wrong barrel. Not only that, but the last 15 barrels had also been the wrong barrels. Somehow we'd gotten out of sequence. "I am much too hungover for this," Erin announced. She stared at the barrel some more. Then she said, "What we need are some big tweezers. Really big tweezers." "I don't think this winery has any really big tweezers," I said. She brightened. "Oh! You know what'd be perfectmy toast tongs!" This was how Erin the intern and I found ourselves spending the next hour fishing out, by feel, pellets of nutrients from the dark depths of 15 wine barrels, using a pair of wooden toast tongs retrieved from the BV staff kitchen. Miraculously, we managed to remove every single pellet, partly thanks to the fact that the barrels were two-thirds full of just-beginning-to-ferment grapes; the pellets were resting on top. "I think we got them all," Erin said, sounding relieved. "I think we did," I agreed. Shortly after that I was talking with Jeffrey Stambor again, about Georges de Latour, about history and expectation, about what it means to produce a truly great wine. "I just don't want to be the one where history says, yep, that's where it all went downhill," he told me. I said, "Well, actually, that might be me and Erin." Photo © Diageo Chateau & Estate Wines. My contribution to the 2009 Beaulieu Vineyard Georges de Latour Private Reserve was not all so hapless, thankfully. Unlike one unfortunate intern Erin had worked with in Australia, I didn't forget to open the top hatches of any tanks while draining wine from them; that causes the tank to crumple up like a tin can in some giant's fist. (Erin's comment on that event: "He was a sweet boy, but off with the pixies. Definitely didn't need drugs.") I can't pretend that the eventual quality of the '09 will stem much from my work, but inasmuch as I helped by shoveling several hundred pounds of pomace (crushed grapes) successfully out of a tank or picking by hand the MOG (Material Other than Grapes) off the black vibrating belt of the sorting table as an endless carpet of Cabernet grapes swept bythink of a 30-foot grocery-store-checkout belt that shakes continuouslywell, there's my signature on this vintage. It's worth keeping in mind that BV makes about 9,000 cases of Georges de Latour, which costs $125 a bottle. This isn't some minuscule, boutique, mailing-list-only effort; but then, neither is Château Margaux, the Bordeaux first growth, which produces substantially more than that. Its 2009 vintage is currently on the market for $1,000 a bottle or so. Quantity neither guarantees nor denies quality. And Stambor's efforts (together with those of his predecessor, Joel Aiken) seem to be paying off. I decided to visit Beaulieu and write about it after tasting an early sample of the 2007 Georges de Latour, which seemed to me a gargantuan leap in quality over recent vintages. And about two months after I was at the winery, the critic Robert Parker scored it 95, commenting that it was the greatest vintage of the wine since the 1970 and 1968. My wineand yes, as far as I'm concerned it's my wine, even if my part in it was, in the end, pretty inconsequentialhad a long road ahead of it after my involvement was over. When I was at BV, we were about 50 percent of the way through harvest; over the next week, bin after bin of grapes would be picked, sorted and sealed up in barrels or tanks to ferment in the Georges de Latour winery-within-a-winery (the warm winery-within-a-winery: To ensure effective fermentation, the entire room is heated; the interns referred to it as "the sauna"). Then there would be roughly 21 months of aging in barrels, and another 12 months of aging once the wine was bottled. Finally, the '09 vintagemy wine, as it werewill arrive in stores in the fall of 2012. I'm looking forward to it; not perhaps as much as Jeffrey Stambor, or any of the other people who worked this particular vintage from start to finish, but enough. Photo courtesy of Ray Isle. I do have a taste of it in my mind to hold me. It came the first day I was working the sorting table. Across from me, one of the crew, a Mexican woman in her early twenties, picked a grape from the river going by and put it in her mouth. She caught me looking at her. "Bueno?" I asked. She nodded, giving me a shy smile. I picked a grape myself from the thousands rolling by. I ate it. It was sweet; funny to think that it also had within it the soul of a wine. "Bueno," I told her, since now she was watching me. She smiled again. Then we got back to work, because, after all, eventually someone was going to have to make all these grapes into wine. This vintage Private Reserve was made by André Tchelistcheff, one of the greatest names in winemaking. Though the wine was 40 years old when I tasted it, it was still lovely, with notes of tea leaf, mocha and dried currant, and a silky texture. "Tons of tannins" was my first note on this big, chocolaty wine. Structure aside, it's rich and dense, with distinct hints of licorice and a lingering finish. Both this and the '69 were aged only in American oak, as were all Private Reserves until 1989. Deep currant and black-raspberry fruit, aromatic and complexafter a decade-and-a-half, this Cabernet is beautiful right now. Stambor noted, "It's the wine for which I first started using Necco Wafers as a wine descriptor." Winemakers! The current release, from a vintage acclaimed throughout Napa Valley, is definitive proof of Latour's revival. Right now it's dark and polished, the ripe blackberry fruit concealing a big, powerful structure.